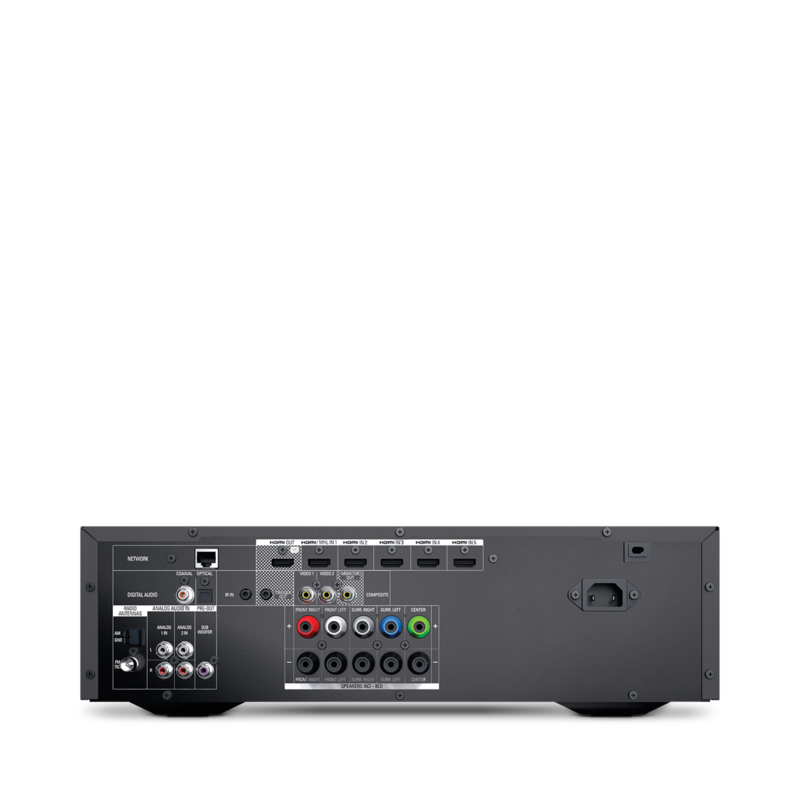 The AVR 1610S high-performance audio/video receiver pumps out 85 watts per channel to power a full five-channel, networked surround-sound system. It can also connect to a powered subwoofer to provide enhanced low-frequency performance for all your entertainment. While the amplifiers retain the time-tested Harman Kardon® high-current capacity (HCC) ultrawide-bandwidth design to ensure the most accurate, dynamic sound with enhanced clarity and realism – even at the highest listening levels, a digitally based power supply gives the amplifiers all the wattage they need without the weight of traditional power-supply designs and their heavy transformers. The net result is a great-sounding AVR in a small form that is friendly to the environment. The AVR 1610S can stream audio from virtually any portable device. You can connect an Apple device, such as an iPad, iPhone or iPod touch, directly to the front-panel USB jack and playback without the need for an external adapter. For other tablets, smartphones and laptops, you can take advantage of the AVR 1610S’s integrated HARMAN TrueStream Bluetooth technology. The HARMAN TrueStream guarantee ensures the best possible listening experience when you stream audio wirelessly via Bluetooth technology. HARMAN TrueStream tech delivers the most current, most advanced wireless option to ensure the highest-quality sound, no matter what application or source device you use. The AVR 1610S features vTuner Internet radio to connect you to a whole world of online audio entertainment. As soon as it’s out of the box, you can stream over-the-air radio stations from around the globe as well as stream from a wide range of Internet-only radio stations. The AVR 1610S also features Spotify Connect, which allows you to stream music directly from your Spotify premium account on your phone, tablet or computer. Five HDMI 2.0 inputs with 3D and 30/36-bit Deep Color deliver high-definition digital video at resolutions up to 1080p with full-fidelity audio through a single cable. There is no loss of video or audio quality because of format conversion, just full-impact Hollywood excitement as its creators meant you to experience it. The AVR 1610S gives you multiple options for audio playback with its front-panel USB port. Simply connect an iPhone, iPad, iPod or USB stick to play your stored tracks through your home entertainment system. Whether it’s captured by your camera, phone or tablet, or streamed from a Roku Streaming Stick dongle, you can deliver high-definition audio/video content directly to your HDTV via the AVR 1610S’s MHL connection. The AVR 1610S delivers high-resolution audio that matches the digital video quality of Blu-ray Disc™ formats, unlocking the full potential of movie soundtracks formatted withDolby TrueHD and DTS-HD Master Audio decoding. No matter what mode or mood you are in, you’ll always hear audio playback at its finest. The new HARMAN EzSet/EQ III auto-calibration process precisely adjusts the AVR 1610S’s volume levels, speaker distance/delay time settings and equalisation to optimize audio performance automatically for your specific speaker system and room conditions. The system features an easy-to-follow menu display and includes a plug-in calibration microphone. The HARMAN GreenEdge logo assures you that the AVR 1610S design is environmentally friendly without compromising the premium performance for whichHARMAN products are known. Thanks to an advanced power supply, the AVR 1610S can deliver high-quality audio in a small, light chassis that uses less metal and plastic. 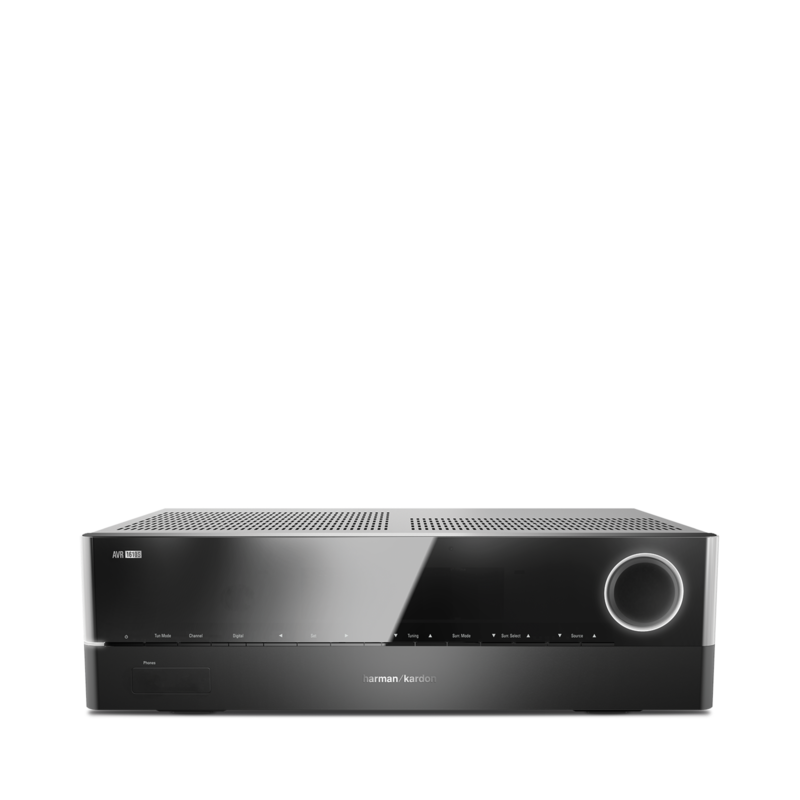 The AVR 1610S takes the award-winning Harman Kardon look to a new level with a flush volume control and more compact design. Because of the lighter weight made possible by an advanced digital power supply, the unit weighs less without sacrificing performance so that it is the perfect match for the thin glass shelves of today’s open TV/ entertainment furniture. All connections on the AVR 1610S are colour-coded to simplify hook-up and reduce errors. Colour-coded binding post speaker terminals on all output channels accept pin connectors or bare wire to provide secure links for your speaker cables. The AVR 1610S simplifies your life with a programmable infrared (IR) remote control. It works seamlessly with the receiver’s multilingual on-screen display, guiding you through system setup and operation with consummate ease. The multidevice remote can also control your TV, cable boxes, satellite tuners and other playback sources. For further installation flexibility, there is a 12-volt trigger output and a remote IR sensor input. Transform your living space into your own private screening room. This 425-watt, high-performance, 5.1-channel A/V receiver gives you more ways to connect to your favorite music, movies and shows. There are countless ways to access and store your favorite media, from external hard drives to set-top cable boxes to smartphones. But if your home audio/video receiver doesn’t give you options for connecting to those media, it’s borderline useless. 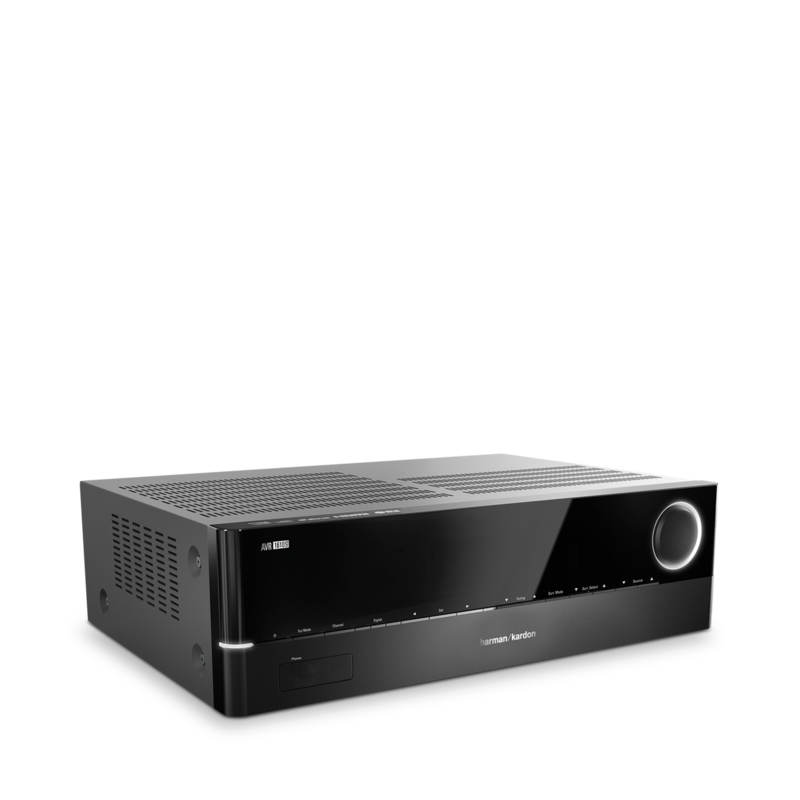 The Harman Kardon® AVR 1610S gives you a simple way to connect to everything you love. This 425-watt, 5.1-channel, networked audio/video receiver is loaded with options that let you access your media. It features five 3D-ready HDMI® 2.0 inputs, including one compatible with MHL, so you’ll have more than enough ways to access content on your HD cable box, Blu-ray™ player, MHL-equipped portable devices. It also includes Spotify Connect and HARMAN TrueStream Bluetooth® technology so you can stream high-fidelity audio from your mobile devices. Regarding sound, the AVR 1610S features our exclusive Natural Sound Processing (NSP), which creates a rich, enveloping sound from any source – particularly with two-channel streaming content. And to get the very best sound based on your speakers and listening environment, its new EZSet/EQ™ III process automatically calibrates the system. And with HARMAN GreenEdge™ technology, the AVR 1610S Sis environmentally friendly, too.